Complete information about the World and its cities. : Mysore : The perfumed Sandalwood City. Mysore : The perfumed Sandalwood City. Mysore city was the capital of the old royal Mysore province. The word Mysore expands to "Mahishasurana Ooru". 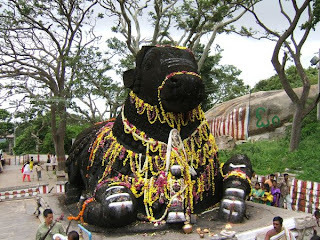 According to a legend, the demon Mahishasura was killed by goddess Chamundeshwari atop the Chamundi hill near Mysore, which gave the city its name. Ever since, the Mysore royal family has worshipped Chamundeshwari as the palace deity. The Hill dedicated to her stands on the the eastern end of Mysore town today. Mysore is the erstwhile capital of Wodeyars, the rulers of Mysore State. The Wodeyar family ruled Mysore since 14th century except for a short period of 40 years when Hyder Ali and Tipu Sultan were the rulers. Today Mysore is one of the major cities of Karnataka. Mysore has emerged as a thriving market for exotic sandalwood & incense, the Mysore silk sarees and stone-carved sculptures. Location: Located 770m above sea level and 140 Km from Bangalore, Mysore, the imperial city, was the erstwhile capital of the Wodeyars, Also known as the city of Palaces. Importance: Famous for its Vrindavan gardens and the Dushhera celebrations. Built in 1924, this is India's first irrigation dam. Sir M. Vishweswariah, the engineer who designed and built this dam, has shown his acumen in converting a dam site into a beautiful garden with colourful fountains and ponds downstream. The dam is named after the then Maharaja of Mysore, Krishna raja Wodeyar, who financed this novel project. KRS represents a marvel of civil engineering achievement in pre-independence India and was among the first in the world to use automatic sluice gates. Locally available surkhi was used instead of importing cement from England. 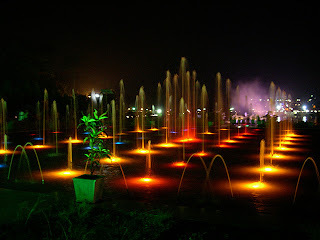 Brindavan gardens is located 12 Km northwest of Mysore city and has rows-of colourful fountains. There is a boating pond to cross the dam from the south bank to the north bank and at the northern edge are the dancing fountains. Using advanced lighting techniques, the fountains are made to jump and dance to the tune of music. The dam is over 3 Km long and is constructed at the junction of three rivers - Kaveri, Hemavati and Lakshmanathirtha. This site has been popularised over the years by the large number of Indian/foreign films shot at this location. Timings: 7.00 P.M. to 7.55 P.M. on weekdays. 7.00 P.M. to 8.55 P.M. on holidays. During winter: 6.30 P.M. to 7.25 P.M. on weekdays. 6.30 P.M. to 8.25 P.M. on holidays. Entrance fees: Rs.10/- per head. The palace was originally built of wood, which got burnt down in 1897 AD and was rebuilt in 1912 AD. 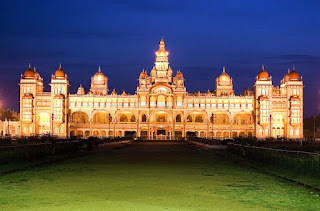 The Mysore Palace, built is Indo-Saracenic style with domes turrets, arches and colonnades; the palace is a treasure house of exquisite carvings and works of art from all over the world. The tastefully decorated and intricately carved doors open into luxuriously decorated rooms. One of the three major Hoysala temples still in daily use today is the Channekeshava Temple of Belur. The construction of the temple, which took almost a century, was started in 1116 to commemorate the Hoysalas' victory over the Cholas. Enclosed in a paved compound, the temple complex includes a well and a bathing tank. It is believed that every major deity of the Hindu pantheon is represented in the temple. Forming the backdrop of the city is the 1,100-feet-high Chamundi Hill. On the top of the hill stands the temple dedicated to the Goddess Chamundeshwari, the royal family's patron deity. To reach the temple one can either drive through the 13-km stretch up to the summit or climb the 1,000 stone steps. Nearby the temple stands the huge statue of Mahishasura, the demon slain by the Goddess. Halfway up along the stone steps stands the majestic 4.8-metre monolith of Nandi the Bull, Lord Shiva's chosen mount. The statue is believed to be 300 years old and its chief attraction, apart from its size, is the meticulous craftsmanship of its ornaments-from its delicate anklets to the magnificent pendant bell around its neck. Mysore Dasara is the celebration of this victory of good over evil. Mysore also has associations with the Mahabharata and King Ashoka of the 3rd century B.C. during the Wodeyar rule Mysore reached the zenith of its glory as a fabled centre of oriental splendour. Pomp and Pageantry Relived Come to Mysore in October when the tranquil city awakens to ten days of Dasara festivities. Brilliantly lit up Palaces, decorated arches, festooned streets, colourful costumes and cultural shows…classical music, folk dances, Bharata Natyam, Yakshagana, Huthari, Torch Light Parade, Theppotsava… The culmination is the legendary Mysore Dasara Procession with caparisoned elephants, the golden howdah, decorated horses, stately coaches, troops in ceremonial uniforms, folk dancers and colourful floats. Bandipura is 80 Km southwest of Mysore, directly on the Mysore-Ooty road. It is a forest reserve created to protect the Royal Indian Tiger and has been one of the success stories for "Project Tiger." A forest lodge located at the heart of Bandipura on the Mysore-Ooty road, provides an excellent and quiet location for exploring this wonderful nature paradise. Early morning, jeeps go out into the forest-taking tourists who want to catch a glimpse of the tiger. With luck, most of them will be able to see the Tiger, Elephant and other wild animals in their natural habitat. For late risers, there is an elephant ride through the forest, which is a pleasant experience. Deers, Langur monkeys, Peacocks; Wild dogs are often encountered on these adventure trips on the elephant's back. The best seasons to visit Bandipura are the spring, post-monsoon, and autumn. During the summer months the forests dry up and water holes are scarce.